It has a total of 125 pages and containsonly artworks. The book fills with more than200 illustrations, and setting materials used in creating the world of Dark Souls one, including the following contents. The Art Of The Dark Souls Trilogy I II III Hardcover Art Book. Art from Dark Souls, 1, 2 & 3. They work very hard to get quality products to you quickly. You will receive the following (if it's not listed directly below, it's not included). Chapter 1 Dark Souls III. The book fills with more than1000 illustrations, and setting materials used in creating the world of Dark Souls III, and the latest DLCs, Ashes of Ariandel, and The Ringed City, including the following contents. DARK SOULS II LIMITED EDITION HARDCOVER ART BOOK & MAP. These would look quite nice alongside a Dark Souls II. 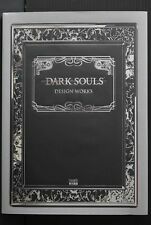 Dark Souls Design Works - Hardcover Art Book - Japanese Used but in GREAT condition. Only looked through once or twice and then stored inside a box inside another box. Free shipping. See pics of this great book from non-smoking home. Dark Souls Design Works (Art Book). DARK SOULS DESIGN WORKS (ファミ通の攻略本). This is an official product, not bootleg. Printed in Japan. Release Date : 2012. Japanese book. Duration: 1~2 weeks. This is an official product, not bootleg. Used but havent glanced past the first few pages. Dark Souls II Hardcover ART BOOK Limited Edition. Art Book Size ~ 8.5" x 5.6" x 0.4" / 19 cm x 13.4 cm x 1.2 cm. Art Book ( ~ 100 pages ) - New . Actual pictures of the ART BOOK on photos. It has a total of 320 pages and is printed inJapanese, and partly English in Ch.2. The book features the lore material of the "Link the Fire" in the Dark Souls world from the point of view of publishers, and includes the following contents. Dark souls 2 collectors edition game guide and statue with art book. Here we have a Dark Souls Limited Collector's Edition PlayStation 3 PS3 RARE Art book Tin ONLY. Only includes the cover, tin, and art book. The pages are falling out of the art book. NO GAME INCLUDED. Will be shipped within 1 business day of payment, check out my store for other great deals! Thanks! Trending at $31.95eBay determines this price through a machine learned model of the product's sale prices within the last 90 days. Hello here is a n ew 2014 Dark Souls II 2 Limited Edition Hardcover Art Book Cloth Map Sealed. Dark Souls II full color art book. 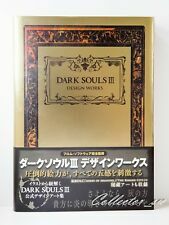 Art Book from Dark Souls I & II Design Works Hardcover brand new from China. Condition is New. Shipped with USPS Media Mail. Dark Souls III Design Works (Art Book) Chinese Version. Condition is New and sealed. Shipped with USPS Media mail. This item has been carefully removed from the Dark Souls II Collector's Edition. The picture describes the item you will receive. make Supersized seem small. DARK SOULS III DESIGN WORKS. This is an official product, not bootleg. Printed in Japan. Release Date : 2017. Japanese book. Duration: 1~2 weeks. This is an official product, not bootleg. If you are big fan, DON'T MISS THIS BIG CHANCE ! International Warranty does not apply to this product. We correspond to it responsibly. Condition : USED. The Limited Edition of Dark Souls contains the following Hardcover art book of artworks and preliminary design. Dark Souls Trilogy - Archive of the Fire. Condition: New. Only use EMS for Italy/Spain. of Pages: 320. FREE to the U.S.A. ASIA and AUSTRALIA FREE to most of Asia. any location. available to most locations. This is an official product, not bootleg. Printed in Japan. Japanese book. Duration: 1~2 weeks. This is an official product, not bootleg. If you are big fan, DON'T MISS THIS BIG CHANCE ! Pages : About 142 pages (No Missing Page).